Day 314 - New Year's Eve! It's the morning of New Year's Eve and I'm about to leave to go swimming, and stop at the store yet another time (no matter how many supplies we lay in, we always run out of something - this time milk and Pepsi). I'll be blogging more later, and tell you some things about broken New Year's resolutions, some things you don't know about me, and other juicy stuff! ;-) TTFN! I'm back, and it's noontime. The Tennessee Titans are playing the New England Patriots! All my family will be rooting for the Patriots, but since I live in Tennessee, I really should root for the Titans. I was in Walmart earlier, and folks were wearing Titans jerseys and talking about the game at the cash registers. Nothing like a team that's been winning to make the fans ACT like fans. However, I would like to note that Tom Brady and Tedy Bruschi are my favorite Patriots. Isn't it an awesome thing for a football player to have a name that is pronounced 'Brew-ski'? HA! Listen, Can We Talk? Warning, Warning - I will now reveal the truth about New Year's Eve. New Year's Eve celebrations are usually AWFUL. I hate them and so do most people. You're tired, (Hello, we get up at FIVE AM) you're in a contrived environment, often among strangers, where you're supposed to GO THERE AND HAVE FUN and then leave. I have tried to go to New Year's Eve parties. I've tried to HAVE New Year's Eve parties. I've tried to just go to bed and forget the whole ***n thing, even that's not fun because then you miss 'IT'. It's no fun, but I don't want to miss it. 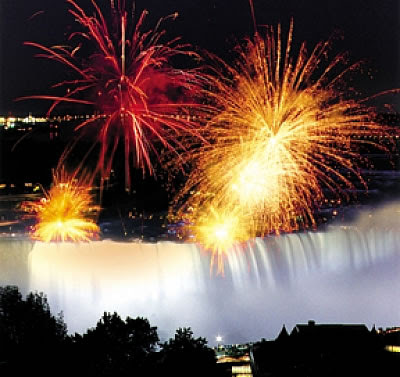 And while I'm ranting, New Year's Eve television especially stinks. Not only that, gentle readers, but you are expected to make New Year's resolutions (these are lies that you tell yourself you would like to make truths out of) and then KEEP them. When I was young, we would write our New Year's resolutions out on slips of paper, then wish really hard and toss them in the fireplace to seal the resolution by fire. Number one resolution - either a 'diet' or 'quit smoking' resolution. Years ago I used to smoke but quit cold turkey by setting a date and telling everyone I knew that I was quitting on that day. I am way too selfconscious to have NOT quit after telling everyone I would, but I didn't do it on New Years. And yes, I know it's easier to just cut off a limb rather than go on a diet, but it is right up there with giving up ciggy-butts. Next in line - various other self-help options like 'exercise', 'eat right', 'communicate better', 'de-clutter my house','manage my money better', 'take up gardening', 'excel in the workplace' etc. TTFN and Happy New Years! Talk to you next year, dearest readers! Sorry to 'click and run', but I just got back from swimming and Sams Club, and we have company coming in an hour for dinner and I haven't started it yet and I wanted to make a dessert too. EEEK! Well GO ON, girl, get a MOVE ON! Welcome Home Will! We love you! Hey, gang - I'm FINALLY back. We had a nice visit with Charlie's daughter and soon-to-be son-in-law, exchanged gifts, and all that good stuff. Can you stand it? I am avoiding the scale as of NOW and I'd better have an extra-long swim in the morning. Is it a valid New Year's Resolution to avoid the scale? 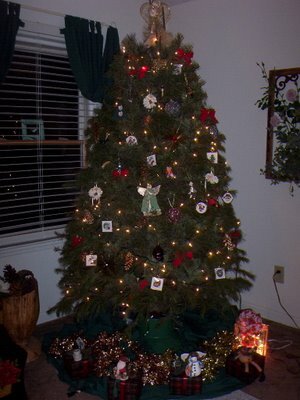 I just finished taking all the lights and ornaments off the tree, and some of my Christmas stuff off the walls. I still have lots of that stuff up. OMIGOSH - I almost forgot to tell this - Charlie and I went for a drive this afternoon, and part of it was through a semi-paved back road not too far from where we live. A house we passed (a rough and tumble cottage, painted a ghastly blue) had decorated an old, rusted out tractor in their front yard with multi-colored lights - it was priceless. It was the kind of picture that could win an award with just the right camera and just the right lighting, but alas, we didn't have the camera with us, so you'll just have to IMAGINE it. Waxing nostalgic - what a year 2006 has been! Maybe I can think of a few things to say to close out the old year and bring in the new! TTFN! For example - what the &^%$# does 'Auld Lang Syne' mean??? A traditional Scottish song, customarily sung on New Year's Eve; the title means “Time Long Past.” The words, passed down orally, were recorded by the eighteenth-century poet Robert Burns. Stay tuned, gentle readers, for more 'Bloggin' New Year'. TTFN! Day 312 - Flotsum, Jetsum, and FROTH! This morning I am working from HOME (insert joy and bliss here), so I am writing my blog later than usual while I drink my delicious coffee with steamed-and-frothed-milk in it. No, it's not expresso based, but I've got the froth and that's what I like best. 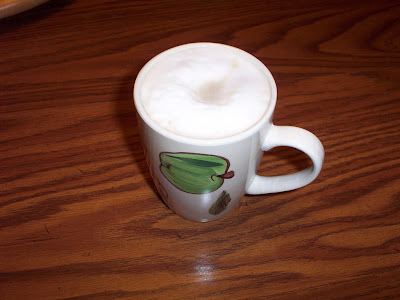 Thanks to my handy-dandy Melitta milk frother immersion whip that my friend CD gave me for Christmas, I have foam with my coffee this morning. Rachael Ray, eat your heart out! This is the first time that I've worked at home at my new job. I have a lot of meetings during the week (which means normally I need to be in the office), but today I didn't have any meetings, so I asked my manager if I could work from home today, and here I am! Since it's FRIDAY, that makes it even better! I have another whole HOUR to have breakfast, read the paper with Charlie, and get ready to come back here to the computer and work from home. 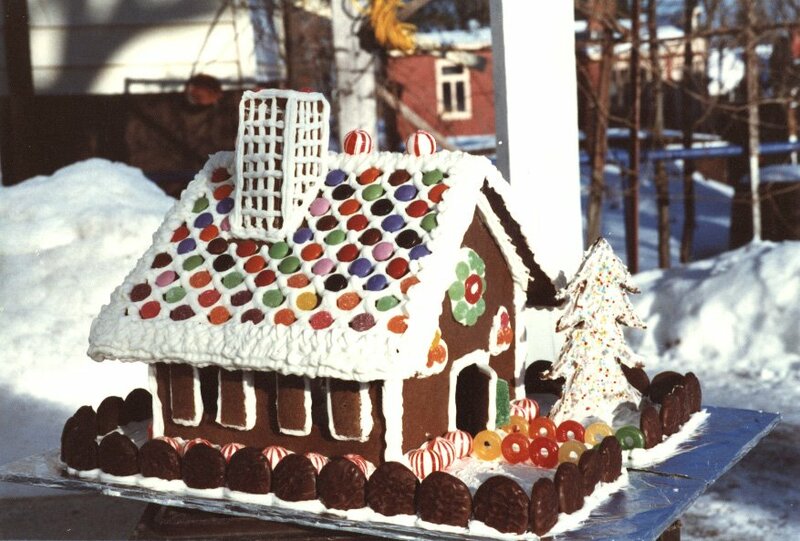 Home Home Home.... AAAAhhhhh.... That is a totally delicious thought. YES, I have my blogging fuzzy slippers on, and that should provide an extra measure of good luck today. TTFN and try not to be too jealous of me! Greetings, Pilgrims on the Path to Bloggy Enlightenment! 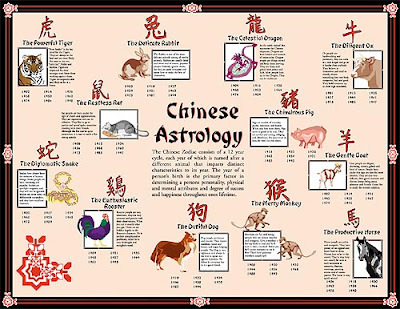 I had a few more inquiries about the Chinese New Year and 'who is born under what sign'. Tiger people are difficult to resist, for they are magnetic characters and their natural air of authority confers a certain prestige on them. They are tempestuous yet calm, warm-hearted yet fearsome, courageous in the face of danger yet yielding and soft in mysterious, unexpected places. They enjoy life full of challenges and unexpected events, like visiting unusual places and meeting interesting outstanding people. Other people in their area are easily attracted by the tiger's enthusiasm and course of life. Tigers find pleasure in the unpredictable, and while other people would rather make a backward step, they are not afraid to explore the new and unusual. But it is not that simple to interest the Tiger. What they really need is first-hand experience. Usually open and frank, these people are likely to withdraw and can be aggressive when trapped. As soon as the Tiger has regained their sense of security their confidence also returns, enabling them to set out once more. These people usually tend to trust their instincts, though there is another side of their personality, which assesses situations thoughtfully before they launch any actions. Their friends usually secretly admire their determination and optimism, though sometimes may find it complicated to share the Tiger's enthusiasm and can be pushed away and left behind. In spite of the fact that Tigers can be courageous and generous friends, if they are not able to achieve what they want, they can be inflexible and self-centered. So if your friend was born in the year of the Tiger, there will be highs and lows in your friendship, but the friendship itself will remain firm. Ideal jobs for tigers include entrepreneur, military officer, politician, musician, writer, poet, artist, theater director, stockbroker, athlete, film star, trade union leader, company director, stunt person, explorer, and lawyer. People born in the Year of the Rabbit often make ideal diplomats or politicians. A Rabbit person has grace, culture and beautiful manners. Although Rabbit people get on well with everyone, at heart they are basically reserved creatures, and are only really happy when they are engrossed in some sort of scholarly or intellectual activity. They are just too sensitive for the world around them. They are not able to thrive in a competitive or aggressive environment, and it makes them anxious if someone forces them to take risks. Their inner world is simply too delicate for unsettled or unpredictable situations, and they tend to create a peaceful and comfortable atmosphere on a hunch. This character trait makes them very hospitable and attentive people, who take care of those around. The average Rabbit person emphasizes the importance of small details. They pay attention to everything from colour, design and furniture to food and conversation. And only when they are sure that everything has been arranged as they wish can these people relax and have fun. Person born in the year of Rabbit often lead a conservative lifestyle where one of the most important things is their security. This quality has a negative side also: opting for safety over risk, they may miss good opportunities. This does not imply that these people are frivolous or irresponsible, for when they truly believe in something, they are serious, perseverant and capable. Like his animal namesake, he is Loyal with a capital "L". He is the one who people are most likely to turn to when they need help. The dog person will come through every time. That is because he/she is sensitive to others and empathizes with them, particularly if someone has suffered an injustice; he/she reacts quickly with the same feeling as though he/she had been personally offended. Friends know that they can rely upon their Dog friend to keep a promise or remain cool in a crisis. People born in this year tend to be difficultly upset and shocked more often than the other signs. The dog is loyal, unselfish, and idealistic. They can sometimes be worriers and overly critical. Dogs go best with tigers and horses. Their friends are other dogs, tigers, horses and rabbits. Dogs get along worst with Dragons, whom they perceive as arrogant and all flash with no substance. I guess that's going to be 'da blog' for today - have a nice day and TTFN! Day 310 - It's Wednesday, But Feels Like Monday! Greetings, Bloggy Gulls and Bloggy Buoys! The New Year Countdown is ON! After 4 luscious days off, it's time to go back to work. Drat. After I upload a picture to Blogger, this new Blogger double spaces all my bloody text. Drat. Our company is sleeping in the other room, and Charlie will be taking over in the kitchen while I'm at work. We had delicious 'crabbies' for appetizers last night (a hot crab meat and cheese mixture spread on english muffins and baked till crisp), then gyros and southern-style green beans with ham. I know that green beans don't go with gyros, but they were a request. We watched 'House of Flying Daggers' last night. It's a martial arts movie, but quite visually stunning and unbelievable acrobatics. I liked it! Did I tell you that 'Eragon' was awful? Don't bother to see it, especially if you've read the books and have an expectation! In February, the Chinese New Year will begin, and 2007 will be the year of the pig. If you were born in 1923, 1935, 1947, 1959, 1971, 1983 or 1995 - you were born under the sign of the pig. Like the pig, you are highly regarded for your chilvary and pureness of heart, and you often make friends for life. For pigs in 2007, any recent setbacks or obstacles can be overcome so look forward to a year in which to really shine, either personally or professionally. I know a lot of 1947-born people, and my sister was born in 1959, so they can look forward to a great year! TTFN - gotta get ready! Day 309 - Company on the way! Sorry for the late posting, I got on road early to go swim! I avoided the mall area today due to the post-Christmas clearance crowd. We have guests coming this afternoon through Thursday. I have to go back to WORK tomorrow, so Charlie is going to be cooking and hosting while I am working. I *think* I'm ready - just got another huge batch of groceries at the store. This afternoon I am making 'crabbies' - hot crab and cheese on english muffin bits for appetizers, with fresh fruit, and for dinner - fix-your-own gyros, green beans with pearl onions, and roasted red potatoes with olive oil and parmesan. YUM-O! I am skipping lunch due to the calorie value of our upcoming afternoon and evening. Hey - do you want a family recipe? This is the recipe my mother uses for apple crisp - but it came from my Dad's family originally! No, the picture at the top is totally different, but it looked good so I grabbed it off the web. Arrange apples in baking dish. Add water. Combine the dry ingredients; blend in the butter with a fork or fingers till the mixture crumbles. Pour these crumbles over the apples. 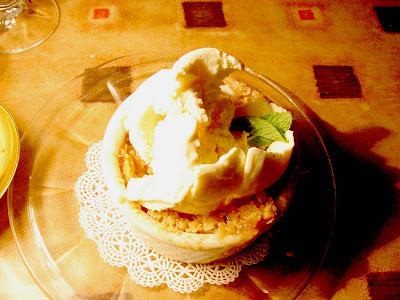 To me - this is the absolute best apple crisp in the world. I encourage you to give it a try. Day 308 - Merry Christmas!!! Did Santa visit your house? Charlie and I are opening our presents right now, so I'd best get back to the merriment. I'm baaack - I love all my presents (I like practical, useful, not too expensive presents), and Charlie likes his too. Confession: I forgot that one of Charlie's gifts was still in my closet - I gave it to him as soon as I remembered. Back when I didn't drink coffee, SOMEONE gave me a coffee maker for Christmas to make HIM coffee with. No, it was NOT Charlie, he would never do something like that. My mother's friend received a potato peeler from her boyfriend for Christmas. So much for that boyfriend. Someone Charlie knows bought 4 tires for HIS car and told his wife that was HER Christmas present. Good grief! My children have received gifts of clothing in the past MANY sizes too small - if you're going to give clothes, ASK FOR THE SIZE! 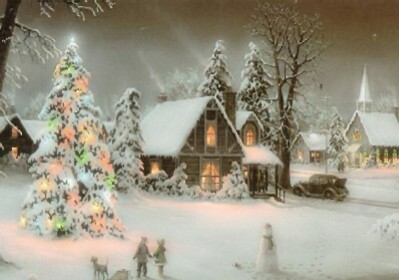 Readers - please feel free to post comments with additional Christmas horror stories! It's 2pm. I am doing some housecleaning (company coming in tomorrow), some wash, I've made a batch of homemade strawberry jam, and we're eating lunch - we'll have our Christmas dinner later tonight. Menu alteration - I put a pot of green beans on to cook - 'Southern Style' green beans take a couple of hours. Day 307 - Merry Christmas-Eve, Everyone! I'm slogging down a cup of coffee, and I already have my swimsuit on to hit the road and go to Nashville to swim. By the way - did I mention that my other, closer health club is CLOSED for renovations all during the Christmas holiday? It might have been nice to have a *choice* of where to swim, but no break there for me. I cooked my Christmas turkey yesterday, and thanks to the remote controlled electronic temperature baking probe my daughter gave me, it was another vastly moist and wonderful poultry sensation. Ladies and gentlemen, if you have never had a really delicious turkey, you don't know what you're missing. Turkey Humor: A three year old once gave this reaction to her Christmas dinner: "I don't like the turkey, but I like the bread he ate." Hilarious! When the kids were small, I used to take them to downtown Providence to a big department store called the Outlet Department store. (Also Shepards department store). "Snow on Christmas means Easter will be green." 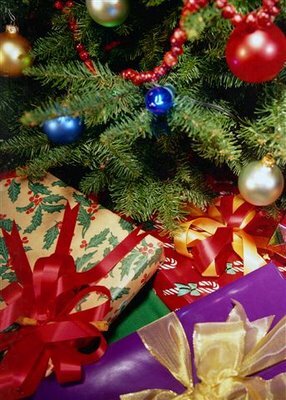 "Good luck will come to the home where a fire is kept burning throughout the Christmas season. "Place shoes by side on Christmas Eve to prevent a quarreling family." "A clear star-filled sky on Christmas Eve will bring good crops in the summer." "A blowing wind on Christmas Day brings good luck." Don't forget to read to your kids this Christmas! 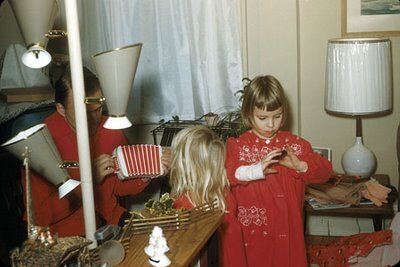 I love this photo - that's me on the upper left under the way-cool starburst clock. Please ignore the plastic still on the lampshade (sheesh, Mom!). Just saying hello... I'm going out the door to go swim, and Charlie is hunting today. We don't have any company coming until Tuesday, so we have an 'open agenda' for the weekend. I'll write more later - I promise! I'm back - and in between I upgraded to the new blogger - pain in the *&^%$ process but at least now I can get into my account! For a little while you couldn't even GET to my blog - sheesh. I got a few more Christmas cards today. Thanks to everyone who has sent us cards - I sent out very few this year, apologies! Newsflash - I am cooking my turkey RIGHT NOW. Why the heck not? Whew, we really live on the edge, don't we? That way we can enjoy it all weekend while I'm off, Christmas dinner will be a breeze, and I can use the bones for a big pot of stock and make lots more good stuff when our company arrives. TTFN #II. Merry almost Christmas! There is just a workday between me and Christmas rejoicing! I wonder if they'll let us out early? I wonder if I have everything I need for Christmas dinner? I wonder if I can FIND the last few items I need to pick up this weekend? Charlie got a haircut yesterday and I didn't even notice - blame it on Christmas distraction. Sorry, Charlie! I am bringing my handy-dandy Lord of the Rings Legolas Lunchbox in to work so I can mouse-proof some things over the long weekend. Shop talk: One of my coworkers came to work yesterday with a very swollen foot and ankle. My manager sent her to the emergency room. She has a broken foot! Karen: I'm running out at lunch - can I get you anything? Coworker: Well, I did need to get some Motrin at the drugstore. Karen: I'll get it for you - what size bottle? 25? 50? 100? Coworker: Get me the 50, that should be enough. So I went to Walgreens. Upon inspection, the 50 tablet bottle wasn't as good a value as the 100 tablet bottle, and if you bought the 100 tablet bottle, you got 25 tablets FREE. So, I didn't get her what she asked for, I got the best priced bottle. :-) That is SO like me. Everyone - be safe, be happy, and enjoy the wonderful holiday season. TTFN! Day 304 - Two More Workdays Till Christmas Weekend! 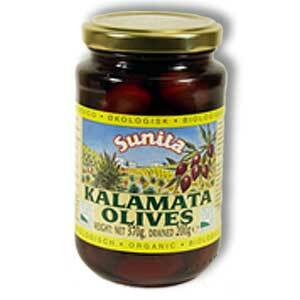 Greetings, Bloggy Gold, Frankincense and Myrrh-Gatherers! 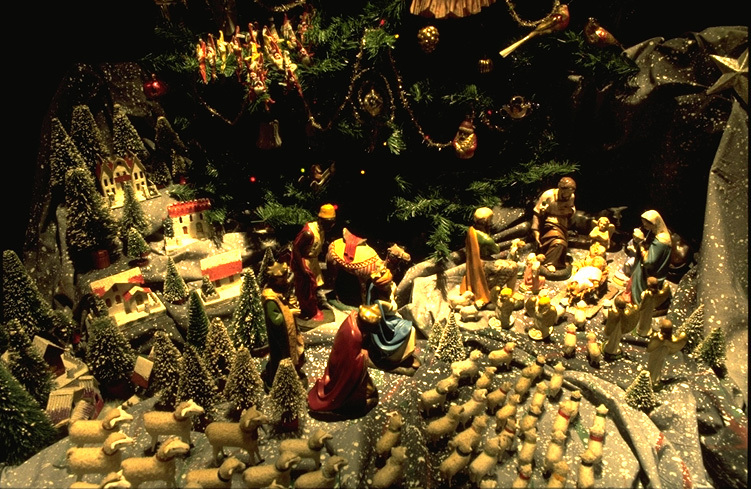 Did you ever wonder what the heck Frankincense and Myrrh ARE? This week was NOT calorie-friendly, by the way. Luncheon AND dinner out on Monday. Mexican food on Tuesday. Pizza party on Wednesday, then Chili-on-top-of-fritos for dinner last night. Ouch. Girl - stop this bloggin' crap and get busy exercising! Go eat some frankincense and myrrh. Christmas preparations... Even slower than my work progress! We have the tree lit every night, and I LOVE to see it in the corner, I'm glad it's UP! We open our Christmas cards and feel guilty that we haven't sent many out this year. That's about it folks, gotta get ready for work! TTFN and FINISH THY CHRISTMAS SHOPPING! 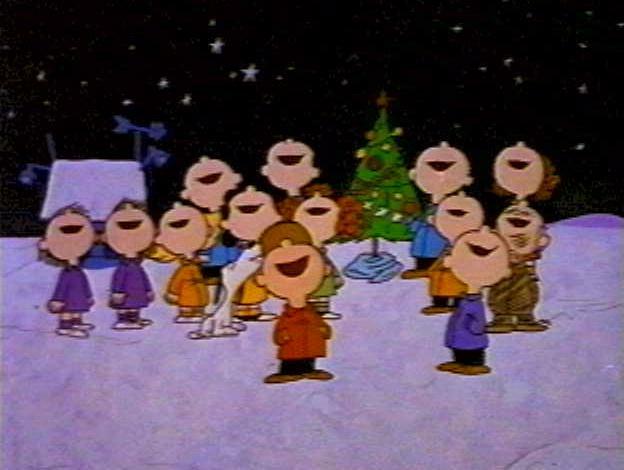 Of course you recognize this image from 'A Charlie Brown Christmas', don't you? I didn't watch it this year! Eeek! I also haven't watched 'March of the Wooden Soldiers' with Laurel and Hardy - that is a family Christmas tradition as well. I also haven't watched 'Mr. 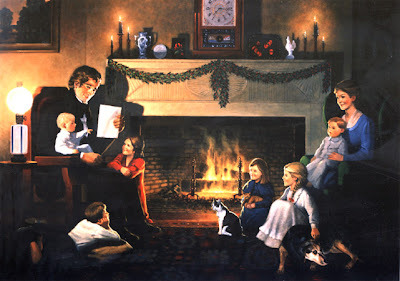 Magoo's Christmas Carol', another family tradition. And you wonder why I'm not ready for Christmas??? Is life all work and swimming? Yep. I have to make this REALLY short, because I am leaving early for work. WHY does work get so busy at Christmastime? My team Christmas get-together yesterday afternoon was fine, and I even like my white elephant gift (a glitter lava lamp thing). The gift I brought in was enjoyed and stolen, so I'm happy. I have too many irons in the fire at the moment, and due to a production issue yesterday, I am way behind where I wanted to be this week. Oops. So anyway, I am going to go in early and try to catch up a bit. I hope YOU have some vacationtime saved up and can take it at Christmas! Enjoy the season! TTFN! 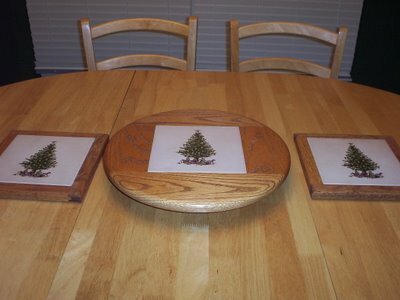 Today’s photo depicts my lovely oak and tile Christmas Lazy Susan and matching Christmas trivets, which are happily awaiting Christmas dinners 'sur le table'. I have quite a bit of Christmas 'stuff' set out around the house and hanging on the walls - I have more, but for just one week I am thinking 'if I take all this out I just have to turn around and put it back again'. I had a wonderful afternoon yesterday, but of course I didn't get everything done that I had listed on the blog... I just visited, ate, swam, and hit the road home. I enjoyed seeing my former coworkers and catching up on the gossip at the Christmas luncheon I attended. I miss them, even now! Contemplation: It is amazing how close you get to the people you work with, even if you don't know a thing about their home lives. You spend a great deal of your life at work, as you know! I ordered a dozen Oysters Rockefeller for my meal, and only shared ONE. They were yummy - although different from the ones I had in Florida, as they were topped with hollandaise sauce rather than melted cheese! No calories in those, girl! This afternoon we have our team Christmas function at Cozymels Mexican restaurant. That should be fun. We're leaving work early to spend the last couple hours of the workday 'bonding'. We're doing a 'white elephant' gift exchange where you re-gift something you already had at home. I like that concept! One of my coworkers showed up at work yesterday with a new tattoo. Mid-life crisis alert! Another of my coworkers caught a small MOUSE at work yesterday. Hide the food, folks! Day 301 - ONE WEEK AND COUNTING! Greetings and Welcome to a New Bloggy Pre-Christmas Work Week! Merry One Week Till Christmas! Here is a picture of my finished tree, and please note my little fake-present-characters under it. They are made out of wrapped boxes with craft-characters on the top of each box. I have to blog and RUN because I am going to work early. I am going to work early because I plan to leave at lunchtime (subject to manager approval). I am going to leave early to join some of my former co-workers at a Christmas luncheon, visit for as long as I care to, MAYBE stop in where I used to work, then go swim and finish my Christmas shopping! (big plan, we’ll see how much of it actually happens). Tomorrow afternoon I have my NEW work get-together and gift exchange. I am hoping that will be fun too. The Christmas tree ‘helper’ guy at Home Depot laughed at his own job assignment. He was quite short and whenever he needed to fulfill his ‘helper’ duties, he would have to go get a ladder, climb the ladder, detach the tree from the line it was attached to, ask the potential tree owner to hold it while he climbed down the ladder, put it away, and came back to move the tree to the area where they would trim the end and all that stuff. My Christmas chore list is slightly shorter, but not by much. Help me get ready in time, Santa! Day 300 - Hey! That's a big number! I've already been up, had coffee with Charlie, been to Nashville and back to swim, and we're just about to go get the Christmas tree (yes, finally finally finally). I am wearing the new bracelet my friend CD gave me for 'early Christmas', and a new pullover that matches it. I'll try to write more later - I need to get the tree decorated, run to Sams club, and MAYBE make a batch of jam, I need a bunch for the holidays and a jar or two for the neighbors (actually only one neighbor, and from what I hear he doesn't share it with his wife or his children!). 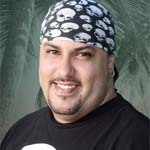 By the way - SURVIVOR FINALE TONIGHT!!! TTFN! There is a 2 hour finale then a one hour reunion show. Product pitch - I bought one of those tree-disposal-bags that you put on the floor and pull up over the tree when you're ready to remove it - to get it outside without contaminating the whole house with needles. Confession - I already put a small hole in it getting the &^%$$ thing open. Issue - I can't find the tree skirt that I put around the bottom of the tree - I might have pitched it in disgust last year thinking I would REMEMBER to ask for a tree skirt for 'early Christmas'. Oops. Please get me a large tree skirt at Christmas clearance and put it away for my present for next year. Right now I have a forest green sheet wrapped around the bottom of the tree and that is the &^%$# tree skirt this &^%$# year, &^%$#. Day 299 - Think Christmas, Girl! 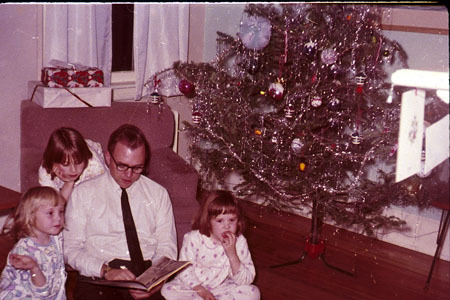 Here is another vintage photo from a past Christmas, with me, my older sister, and my father. That mop of blond hair in the center of the photo is me. 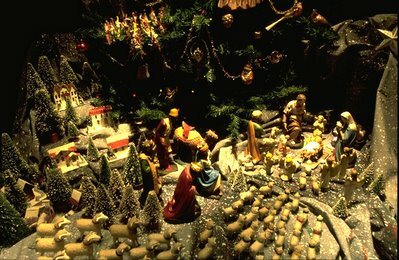 Note the Nativity setup (creche) in the left corner, the present debris around the floor, and try NOT to notice the plastic still on the lampshade in the back! I should also mention the table the lamp is sitting on. Mom- tell me if I don't have this right! My father was a minister, and when one of his churches was renovated, they took out the old pews and brought in new ones. My father took some of the wood from the church pews, refinished it, and made a coffee table and two end tables for us. They were wonderfully sturdy, as well as 'special'. What do you think of that? I am using Internet Explorer 7 now, and my blogger fonts look different - 'Does this font make my blog look fat?' Darn tootin' it does. I am already on my second cup of Bloggy juice (caffeine infusion), and will be leaving soon for 'swimmage and shoppage'. I HAVE to get the tree and get it decorated this weekend! Goodness gracious! What will Santa think of me? Lunch out yesterday - two taco bell soft chicken tacos (fresco style - they leave off the cheese and sour cream so they're not fattening) and a Venti Nonfat Cappuccino with 3 sweet n lows. They went just fine together, thank you very much. After having all that coffee I had to beg the instructor for a break midafternoon. I got the NICEST, NICEST, NICEST Christmas message in email from my former manager where I used to work. I don't think he reads my blog but I am thanking him anyway. Have a nice Saturday, everyone! TTFN! Day 298 - Ready, Get Set, LEARN! I'm the one on the lower left, holding up my hand to keep my bracelet from falling off. I remember the flannel pajamas I am wearing, there was something special about them. I think they had writing on them in different languages. It's Friday, and that means it's a good day. It's going to be clear and nearly 70 degrees, and that means it's a good day. I have to go to a technical training class today offsite, and that means it's a good day. This is going to be rather short, as I need to get ready and leave early due to traffic issues. It's nearly 50 miles to get there. Wait a minute, I need to go spray my hair with the Biotouch nutri-care conditioning spray my sister gave me at Christmas (anti snarl stuff). It smells like baby lotion. Confession: I often brush out my hair at the computer. I can tell myself I'm getting two things done at once, but since both activities require MY HANDS, that's not quite accurate. Changing subjects back to Christmas... Let's do some quotes, shall we? I laughed out loud at the tinsel quote. How lucky to find it today! TTFN folks and have a wonderful weekend. Don't forget to Christmas shop! 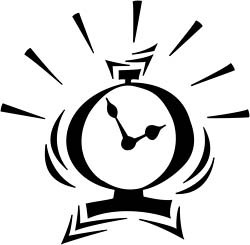 This morning was a three-alarm morning, meaning I could have used three annoying blasts from the morning-persecution-machine to get up! Alas, we only have TWO alarms on the alarm clock. They beep using two different tones and decibel levels. They are set 10 minutes apart for just the right morning JOLT. Whenever I went outdoors to walk (it was a picture perfect and warm day), I would check out how lovely my Honda-CRV-4-Door-Color-White looked in that spot. Mmmmm, tasty. Now I realize that I need to go to the car wash and get the car sparkling inside and out, so it will look even better in that spot. Yes, I still have fried chicken crumbs on my floor mats from a month ago. Speaking of parking spaces, I witnessed something pretty funny last night while I was sitting in a parking space at a little strip mall. A woman came over to the car on the right side of me, opened the door, and started to load her baby carrier into the back seat. She stopped, removed the baby and carrier, walked around my car to the vehicle on the other side of me, and proceeded to open that car door and load the baby into THAT car! Is the tree up? No. Is the tree purchased? No. Christmas interior decorating done? No. Shopping for Charlie completed? No. Food shopping for Christmas dinner done? No. Gift picked out for the gift exchange at work next Tuesday? No. Good grief, Karen. Whassup with that? Get it in gear, girl! Well, I got ready for Early Christmas on time, wasn't that enough? TTFN! I walked into the 'home office' room just now. I was still logged into Blogger and still had a half empty cup of coffee on the computer desk. Oops. Must have gotten 'distraculated' - yes, I made that word up. I can, because it's my blog. Yesterday's Cobbler-Bribe was hugely successful. I noticed there was very little 'sharing' of it going on. Another story from work - my manager told me of her fabulous, fresh Christmas tree this year. It cost $80, but she paid $40 for it. The reason she paid $40 for it was her neighbor had bought it, discovered some allergy to it, and had to either throw it out or resell it for whatever they could get. Not a bad find if you ask Ms. Cheap! One more selfish comment, then I'll close. I went over to the Rec Center to swim yesterday after work (I had come in early so I left at 4:30). I am still trying to recover from my eating expedition this past weekend. I was SHOCKED to see that it was almost deserted! Only a handful of people swimming, and a small water aerobics class that starts at 5:30. I inquired, and the swim teams have gone to another location, leaving the pool for little old ME ME ME. I am definitely going to go there again on a weekday! TTFN! Greetings, Bloggy Wheelers and Dealers! Today's blog is going to be a 'click and a promise' while I watch over my bribery-cobbler (is that a flavor? ), which is in the oven. 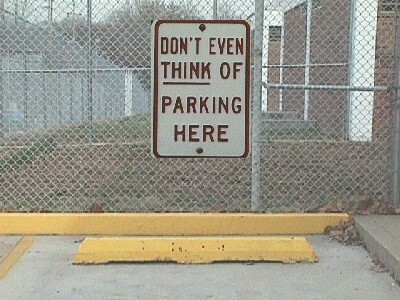 By the way - at my FORMER work, some years I had a reserved spot in the parking garage, and I truly enjoyed it. I have a 'thing' about getting the same parking spot - some folks who read this blog can tell you about that. Another team member is responsible for coordinating the parking-spot-wanna-be's. He has indicated he is receptive to the following bribe - peach cobbler, now renamed to 'bribery-cobbler'. 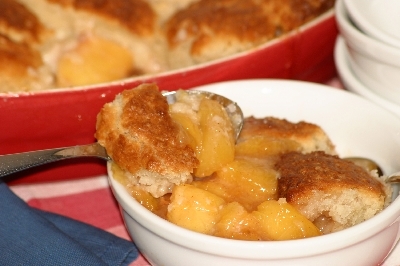 Another plus - today the real Employee of the Month - the team member from Atlanta - is also in the office, so can enjoy some of the cobbler instead of just hearing about it. I admit, I would have made the cobbler anyway, but I also don't mind getting a few days in a reserved parking spot! Greetings, all of you out there who were ever born! (or borned as I have heard it fractured). 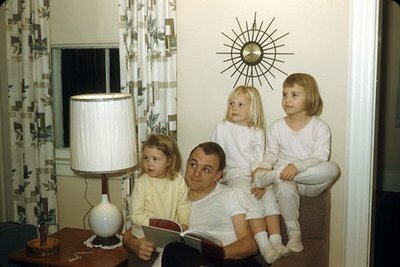 Happy Birthday to my brother Dave (pictured), and Happy Birthday to my niece Mary-Amelia. Now you're famous because you've been named on 'da blog'. David's expression in this photo is - 'I'm being polite about this but I wish you'd disappear so I can put my hand in the fish tank at Grandmas house'. At the back of the photo is desk with an old black rotary dial phone that had a METAL dial, before the dumb old PLASTIC ones came out. I remember that phone! I did like when phones came out with lighted dials (she admits). 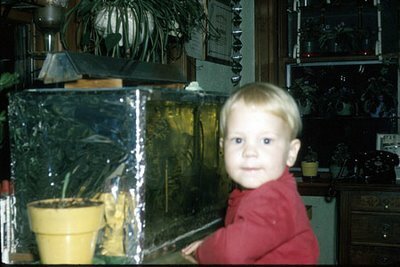 So - does anyone know why one end of the fish tank would be covered with tin foil? To hold the heat in? To make a reflection so the fish wouldn't bump into the glass? Curiousity killed the blog. Oh - I forgot to say that I am back in Nashville again! I had a nice day of visiting yesterday - after I had eggs and leftover spanakopita for breakfast - and even a few more presents like a brand new backup pool noodle (the same color as my old noodle) in case I lose the old one. My son took me to the airport, and my flights were uneventful except for a stupid gate change in Philadelphia. My flight was supposed to stop and not change. After everyone was off the plane, including some of the through passengers who had deplaned to get something to eat and stretch their legs (leaving their belongings on the plane), they announced the gate change. Not only was it a different gate, it was in a different concourse, so I had to hustle along to get from the end of the C concourse to the end of the B concourse. Grumble grumble grumble. Very quickly, this is what the airport restrictions are like at the moment. You put your cosmetics and any small liquids like soap and shampoo in an 8x8 ziploc bag. You put the ziploc bag in one of the scan bins, not in your purse. You don't wrap presents - I brought a supply of tissue paper, felt stockings and gift bags to place items in after I arrived. Items like my jam I placed in plastic containers with bubble wrap and peanuts, and they looked at all of those. After you are through security you can buy water and drinks and take them on the plane, you don't have to throw them out when you change planes. Greetings, Blogregation! What a great weekend I'm having, and it's not over yet! Yesterday was our 'early Christmas' family gathering - complete with kids, son-in-law, nephews, sisters, brother-in-law, mother, step-dad, and an aunt and an uncle. Heather and I loaded her car to the brim with presents, homemade jam (which thankfully didn't get broken on the plane up here), and I had a box on my lap containing the prime rib, hot from the oven. My sister outdid herself in the kitchen! THANK YOU THANK YOU THANK YOU! The food was UNBELIEVABLE - my contribution was the prime rib. The company and 'family time' was even better than food or presents, but when you put them all together it was just spectacular. Here is a partial listing of what we ate, just because I won't remember everything! It was a great day. We went to sleep just before midnight (again)! I'm still at my sisters right now, but will return to my daughters house for more socializing and a visit from my friend CD who I haven't seen since summer. You all have a great day - I'll be heading back to Nashville tonight with my suitcases refilled with presents for me and for Charlie! TTFN! Day 292 - Early Christmas is HERE! Greetings, Bloggy Santas-in-Waiting! Early Christmas has arrived! Poor Charlie didn't get a lunch yesterday so I could hit the road early, before he left for work. My commute to Nashville was great - traffic wasn't bad, no delays. I was in the pool at 7:30am with a free cup of Starbucks coffee in hand, and noone else in the pool. I had a very leisurely and non-intensive one and one half hour swim (actually one hour and thirty five minutes), which was DELICIOUS and DECADENT. The last half hour, I had company. I saw a few of the senior citizens I used to chat with, back when I was unemployed. We talked about the usual things - where their arthritis was bothering them, travelling, the holidays, and cookie swaps. From there - I went to Kmart for some last minute items - some stickers and a marker to write 'FRAGILE' on my luggage, AND I bought myself a tacky-but-fun sequined hat that I was brave enough to wear all the way to Rhode Island. Hey - things like that make me grin ALL DAY. Near midnight, I was done with my Christmas sorting, wrapping and packaging, and fell into bed! A little later this morning we'll get the prime rib into the oven, then head out to my sister and brother-in-laws for the big dinner and festivities! Whew! So have a nice day, even if it might not be as fun as mine! TTFN! Seasons Greetings, Bloggy Babes and Bloggy Dudes! As you know, I'm leaving for New England for 'early Christmas', two suitcases full of presents with me. Hopefully the airline baggage folks won't jump up and down on them and break everything in them. It is the coldest day of the year so far - it is down to 11 degrees. Brrr! I wonder if I should stop for gas when I'm on my way... NOT! I am going to be good and go swim before I get my plane. I am going to 'blog, slog and go' - that means write a quick blog, slog down my coffee, and hit the road. I had a busy week at work, and I'm ready for my break and ready to celebrate with my family! Heather's picking me up at the airport - thank you Heather! See you soon! Day 290 - Thursday and Survivor Night! It's Thursday so we only have to wait one more day for the weekend to be here! Goody! Isn't this the prettiest tree decoration? 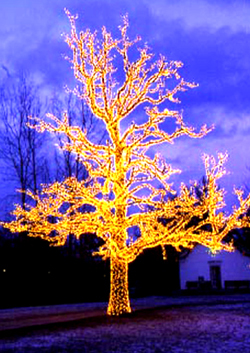 The whole beautiful tree and all of its branches covered in lights. I love trees. It makes me laugh out loud when people have a huge tree and throw ONE strand of lights into it like a lopsided lasso, in the dark it just looks like a mistake rather than a decoration. Ok, little things like that BOTHER me, but I try not to say anything about it... My son has inherited this characteristic, because he told me it bugs him that his automobile inspection sticker was put on crooked by the mechanic, and now he has to LOOK at it EVERY DAY. Moving right along before Doctor Bloggy comes after me. I found an article that looks at the use of coal in stockings - kind of funny... Reprinted without permission from 'The Onion'. Gotta go for now - I leave tomorrow for New England, but will try to say 'Good Morning' to the blog tomorrow before I leave. TTFN! Day 289 - Wednesday Already! It's Wednesday already - how does that happen so fast? 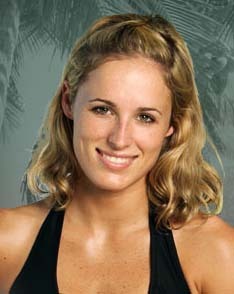 Happy Birthday to Katya today! Have a fun day! 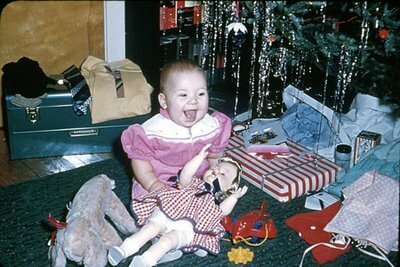 This vintage photo is of my older sister's first Christmas. I wasn't born yet, otherwise I'd be in it too. So - what do we have under the tree? Any good stuff? Pretty traditional gifts - a doll, a stuffed animal, tool box for Dad, a tie and a shirt (what else does anyone GET for Dad anyway?). Gifts from Santa Claus in our house were never wrapped - that's how you knew they were from Santa! What was IN the stockings? An orange in the toe, always. Mixed nuts in the shell. Candy, and if you were lucky some of those chocolate coins - I still love those. And of course a candy cane! 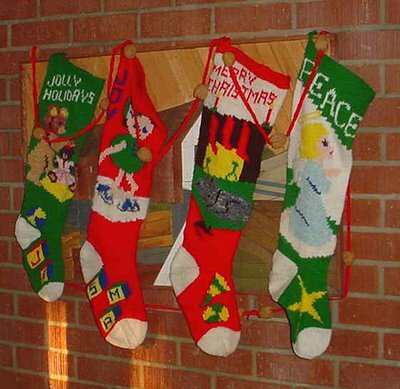 The stockings you could empty early before Mom and Dad were up! Well, it's time for me to run along... I'll be talking more about Christmas as the days go by. TTFN and have a nice Wednesday! Day 288 - It's Tuesday, How Many More Shopping Days Till Christmas? Greetings, Double-Troublers! It's Twofer-Tuesday! Do something twice today (your choice). I have picked up a few gifts this past week, and I'm ready for my 'early Christmas' trip to New England to see the family and exchange gifts. That is a relief, because I leave this Friday! I am still less-than-motivated about all the other Christmas preparations. I need to listen to my Christmas tapes and get in the Christmas frame of mind! It's the first week in December, I haven't done my Christmas cards, I have shopping and decorating left to do, and haven't bought and put up a tree yet. I have lots of Christmas 'stuff' put away that needs to be taken out. Oops. Aw so what - if I'm ready by December 25th, that will work, right? And of course, when I start looking around the house for the Christmas stuff I find Halloween and Thanksgiving/Harvest items that I could have taken out and used if I had remembered where they were! Oops. Seventeen degrees again this morning - bloody well cold. I saw a car decorated like Rudolph yesterday in the parking lot at work. It had a big red plush nose on the front grill, and two plush, rather Bullwinkle-style antlers on each side. Way cute. I wonder who owns it - I'd like to see WHO has the motivation to drive around that way. Someone I work with stopped by my cubicle yesterday, eating his lunch. His lunch was the giant sized Symphony chocolate bar - you know, the ones that are 5x7 or bigger. I teased him about eating candy for his lunch, and then offered him a choice from my leftover-Halloween-candy bucket. He waved his chocolate bar at me like 'Well, I'm already eating chocolate'. I said 'But what will you have for dessert'? This is for dessert! That was a horse of a different color I guess, as he took a Baby Ruth back with him for his dessert! Greetings, Bloggy Beginning-of-the-weekers! I'm not going to say the 'M' word. 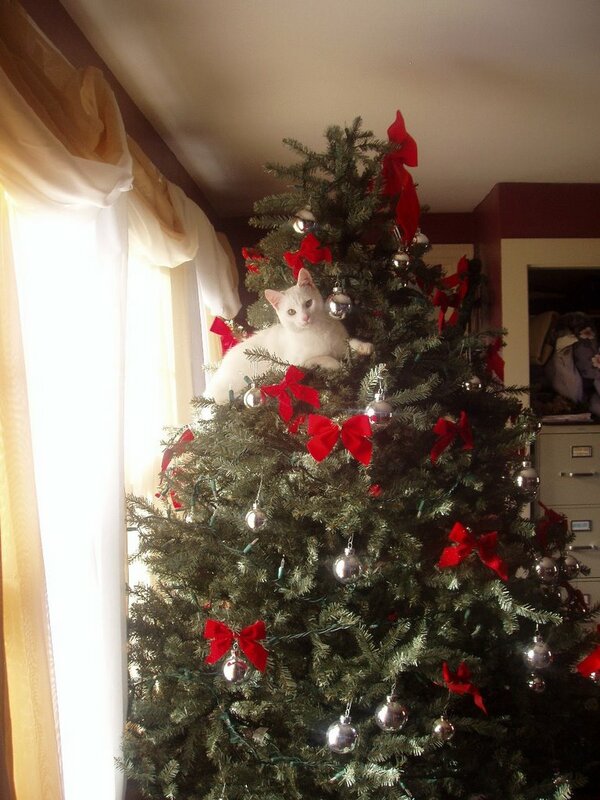 The best part of today is going to be the photo of my daughter's CAT in her Christmas tree! Isn't this the cutest thing? This cat doesn't go outside but it sure knows how to climb trees - go figure! Don't know what that's all about but I'm already running late blogging after trying to figure out why. This is going to be short, folks! Second of all, Amazon.com lost an order (well, the order went in but the package never arrived). They are expediting another item so it's not a loss, just a hassle. Fourth issue - we had a power failure yesterday and it seems to have zapped our cable converter box. The clock is stuck on midnight, so when you use the channel guide it only shows what's happening then! We have a call into the cable company and they can't come till Wednesday, which of course is a workday! So is that enough to complain about this morning? Looks like enough to me! Charlie and I had a nice weekend, but that's OVER and NOW it's the WORK WEEK. Grumble grumble grumble. TTFN and I hope you have smooth sailing today! Are you looking for a wonderful, different and healthy recipe that is great for company, looks sensational, tastes even better, AND COOKS FAST AND EASY? Charlie and I had dinner at our friends house (T&S) last night, and BOY was it ever DELICIOUS! We were treated like royalty. Thanks, T&S! Beside scrumptious appetizers, our entree was the most wonderful Mediterranean Chicken - boneless chicken layered with spinach, onions, feta cheese, Kalamata olives and sun-dried tomato, which is then cooked at 500 degrees in aluminum foil packets. They saw the recipe on Emerils show, and I looked it up just now so I wouldn't have to type it! If you use the Food Network recipe, increase the cooking time to 20-22 minutes, 12 minutes isn't long enough if the chicken breasts aren't super-thin. I love anything with spinach and feta cheese, the olives and sun dried tomatoes give it a great flavor, it is moist and YUMMY and I will definitely make this sometime! Ah well, I have to stop talking about food and go swim to burn off some of the appetizers! TTFN! Day 285 - Happy December! Greetings, Bloggy Weekend Warriors and backyard bird watchers! I forgot to say 'December is here' yesterday! It sure FELT like December, too! 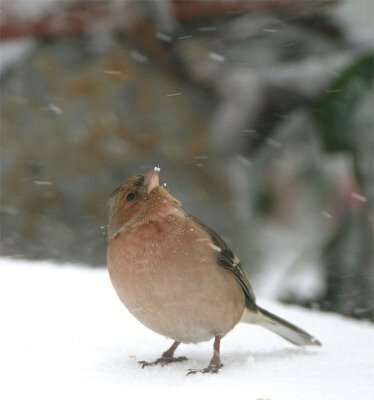 Isn't this the cutest picture of a finch looking up at the snowflakes? I arrived at the gas station yesterday morning at 7am, the wind was howling and tiny grains of snow were flying around. How appropriate for December! To my rescue comes the gas station owner - an older man who seems to help out 'da ladies' who go in there for gas. He was almost unrecognizable, he had a parka on and the hood tied around his face, and all I could see were his eyes. But since he's pumped my gas before, I handed him my credit card with confidence and he filled up the tank for me out there in the cold and wind. I need to stop by there with a jar of jam for him sometime soon. I really didn't intend to write so much this morning, it's almost 7 and I need to hit the road to go swim and run errands. I'm slogging down the bloggy juice before I go. Charlie and I are invited to a friends house this afternoon for dinner and couch-football, so I want to get going early! Have a great Saturday and don't forget to Christmas shop! TTFN! It's Friday! March in a circle to stay awake. We had storms overnight and several power outages, and we didn't get much sleep! Above - left to right - Adam, Candice, and Billy. Candice gets voted off last night and Adam smooches her thoroughly on camera before she leaves! Won't Billy, alias 'Metal Boy' - the-band-member-who-thought-she-loved-HIM be jealous? 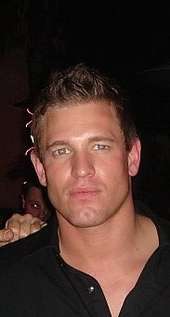 Will Pavarti (the boxer) take Candice's place with Adam on the lip-locked lovers isle, or is she saving herself for best-buddy Nate? Will Jonathan last ONE MORE WEEK before even the sea creatures hate him? Tune in next week to see! Gee, I could SO write copy for an Entertainment rag, couldn't I? Considering the power outages we've had already, I'd better post this blog! I have GOT to stop this morning and get gas (I was too lazy to do it last night) and I am going to be FROZEN when I do. So, gentle readers, adieu, adieu, parting is such sweet sorrow. (barf barf).